We noted earlier this summer the arrival of a truly smart basketball, the 94Fifty from InfoSports Technologies, which uses embedded sensors to measure everything from shot arc, release times, backspin, speed of and power of dribble, and so on. Players can then view the data wirelessly on a smartphone or tablet. But sometimes you’re just a man and a hoop, trying to improve your shot. 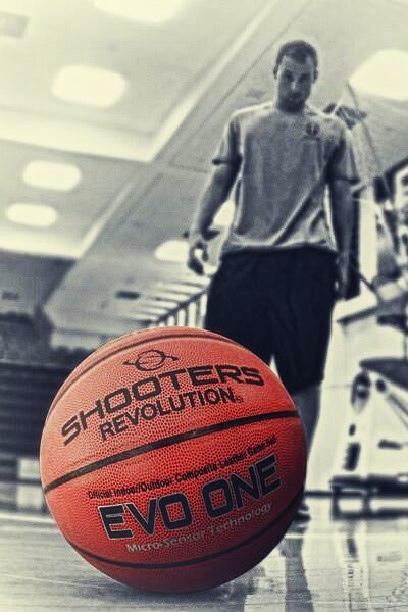 For those who want a responsive experience without having to stop training, the Evo One by Shooters Revolution might just be the trick. No external gadgets required. Inside the ball is a sensor calibrated to measure optimal backspin rate, axes, and balance of the ball during a shot. When a player’s hoist hits that rotational sweet spot, he gets audible feedback from the ball (a Galaga-esque chirp) to reinforce the proper technique. Shoot improperly, and the ball mocks with its silence. Shoot like Joakim Noah, and it cries. One very cool feature of the Evo One? The sensor is removable, so once a player is done training and wants to ball up with some buddies, the ball shuts up. Because, frankly, it could get annoying otherwise. Then again, sometimes you don’t care what the ball looks like as it goes in, you just want to know when it does, and from where. Enter Hoop Tracker, from Wireless Sports. Before taking the court, a player straps what looks like your basic sports watch to his non-shooting hand. A shot detector housing an internal 3-axis accelerometer is attached magnetically to the rim, with the help of a provided 55 inch “mounting pole” (which they may want to re-name). From there, the watch and shot detector work wirelessly up to 45 feet, monitoring every attempt from around the floor, noting a make or miss and calculating a percentage. The watch stores up to 10 separate shooting sessions, and all the data can be transferred to a computer via USB and tracked over time through HoopTracker.com, making it easy to recognize strengths and weaknesses. Customizable training programs are available, as well.